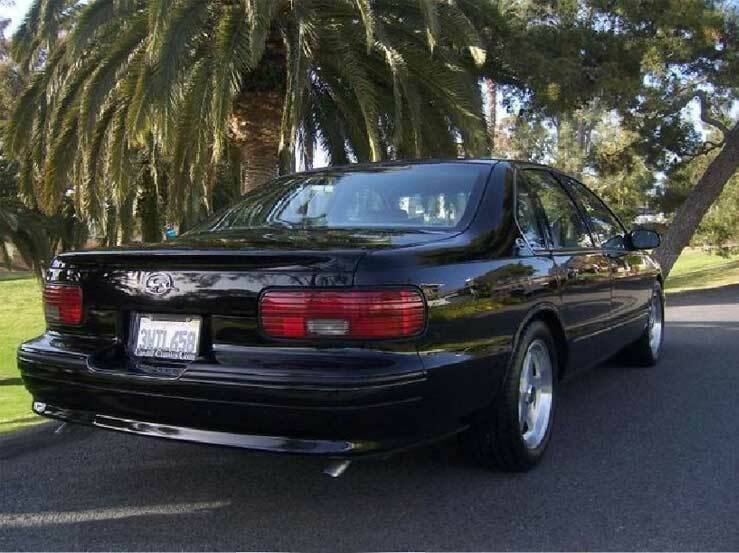 The prototype dates from 1992, it is part of a Caprice Police package because of its chassis and its enhanced suspension, rear wheel passages were modified and grafted it to a big block 510ci (8.4L). The welcome was so warm it was decided to start production parallelly to Caprice. Tout range everyone knows the Chevrolet Caprice, we do this more. Its sporty derivative, the Impala SS is less known in our skies. It all started with an exercise of style and the desire to show what could be the descendants of the legendary Impala SS 60s. 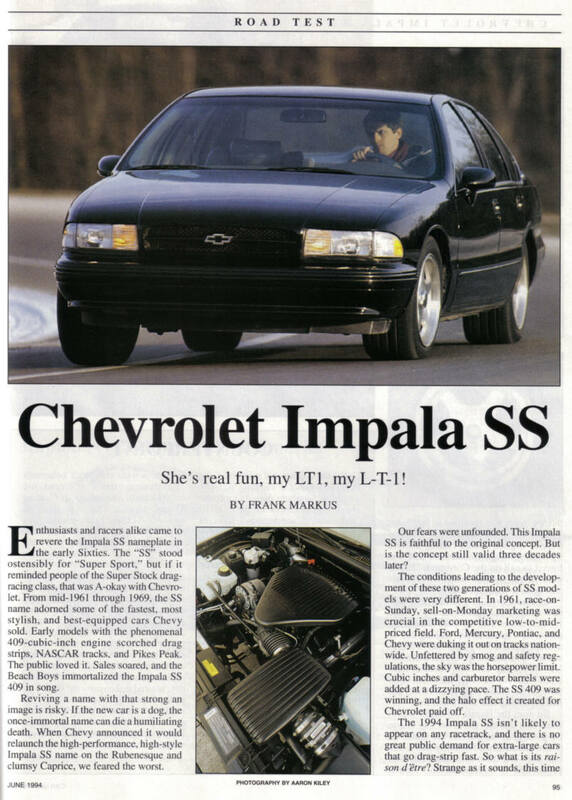 It was in 1994 that was officially launched Impala SS. 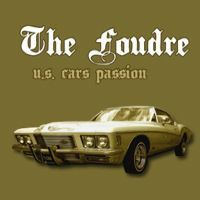 The standard model still had to review its sporting pretensions down compared to the prototype, the big block exit, replaced by a small block LT1 350ci (5.7l) derived from the Corvette. And yes, derivative, because the LT1 could not be taken as such because this engine delivers its full torque and power in high speed in the Corvette, and in the case of a sedan, the result would not was acceptable. It took replace the aluminum heads from other models of cast steel and reduce valve lift to get more torque at low speeds. It is still 260 horsepower on the Corvette 300 but this value is purely theoretical because in reality the estimated power is greater than 300 horsepower. This in order not to frighten the insurance companies (old custom dating back to the era of muscle cars). Transmission is via a 4-speed automatic transmission with overdrive type 4L60-E electronically controlled, derived from the well-known TH700R 4. 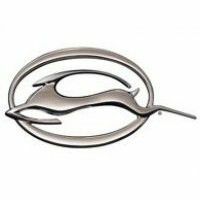 The success was immediate, but in 1994, Chevrolet has limited its production to 6,303 units due to supply alloy wheels break. 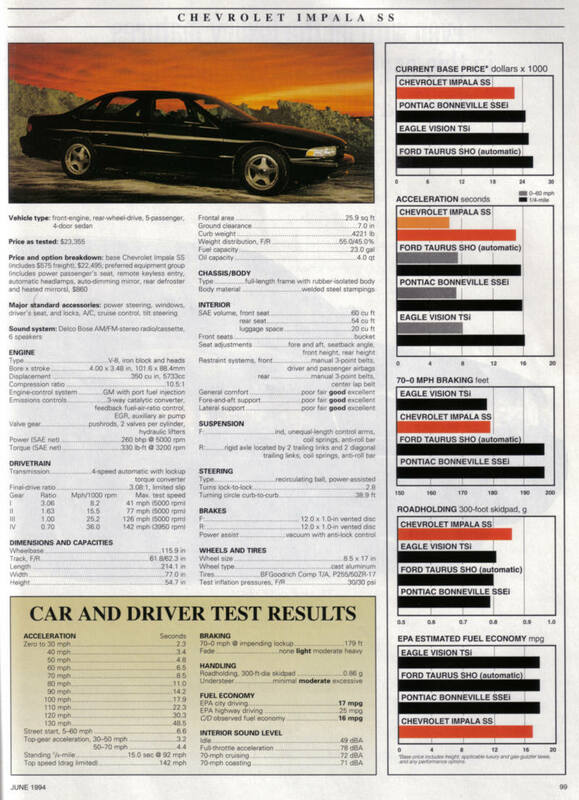 The Impala SS is based on 17-inch wheels with tires 255/50x17. For its first year of marketing, the only color available was black. 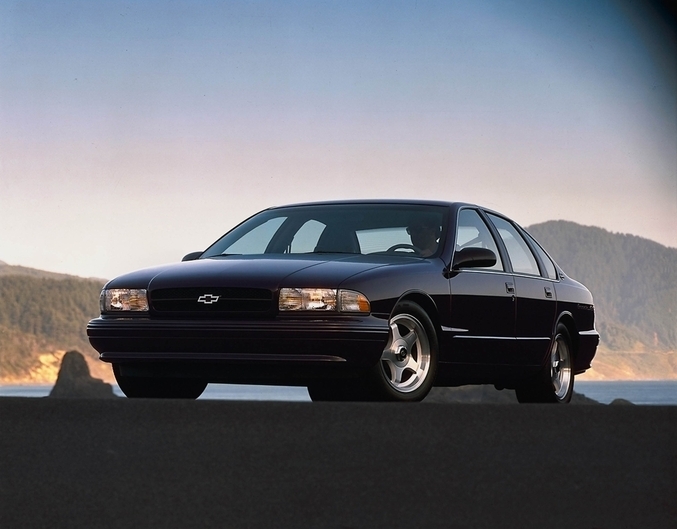 In 1995, the changes remain minor, exterior mirrors fold and become more settled forward and two new shades are available in addition to the black, gray, dark green (dark green-gray) and dark cherry (dark cherry). The sales of 21,434 units for this year. At the end of 1995, the new fall 1996 will be the last year for full-size sedans, General Motors, in fact, in recent years, sales continue to fall and the company wants to spend its plants making SUV like the Tahoe and Suburban with sales increases. 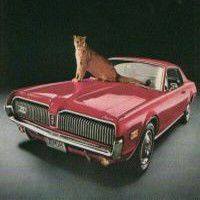 It is believed that the future is not sedans. 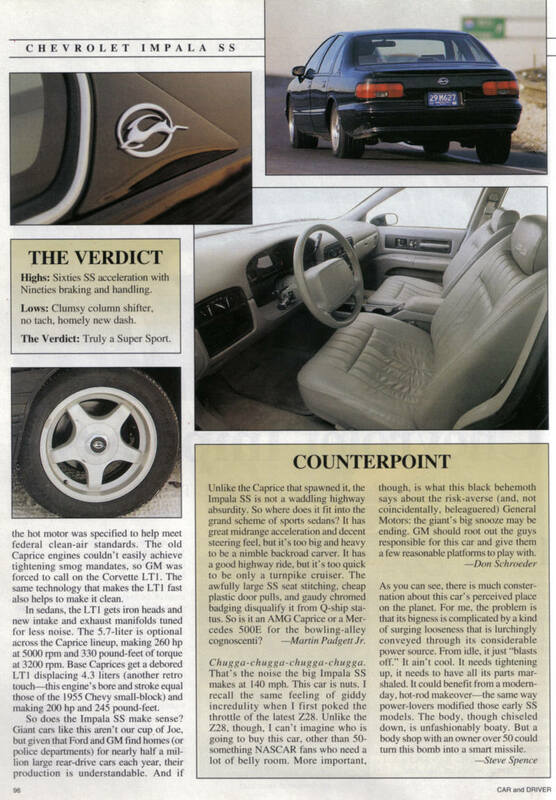 There are still some changes for 1996, the shifter (shifter) leaves the steering column to be installed on the center console and the digital instrument cluster is replaced by an analog display. All fans who got wind of the model ceases production rush to buy their favorite model, sales explode and reach 41,941 units this last thought, exceeding sales Caprice (27155). The assembly lines will definitely stop 13 December 1996. If you want to see the gallery ... Click Here. 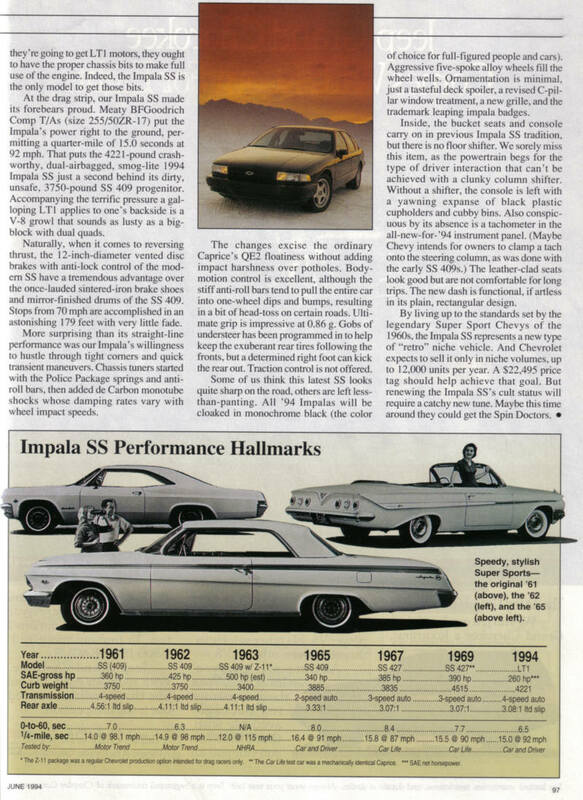 The Impala SS, since its launch, a car cult collected all since the beginning by the fans. It is either kept "stock" (unmodified) is optimized to make it even more effective. Or otherwise transformed into a beast drag strips (sometimes over 1,000 hp). Some new models are lovingly kept and never driven one. Different adjectives to evoke the model are: hot-rod Caprice, 4 door Corvette, best Chevy ever the best Chevy of all time.